A favorite topic for preschool is My Family and Me. Preschoolers love to talk about their families. Learning about families helps a preschooler's vocabulary as he/she learns to label family members. Plus, reading about loving moms, dads, grandmas, and grandpas, is just fun! Whether studying families in preschool or reading about families at home, books about families are a good way to help kids bond and form loving connections with adults in their lives. All kinds of Families by Mary Ann Hoberman is an interesting book to include on a study of families. In this story, the author groups objects into families and then compares it to human families. It would be great for kicking off a My family and Me preschool theme as you ask children to think about the question, "What is a family?" 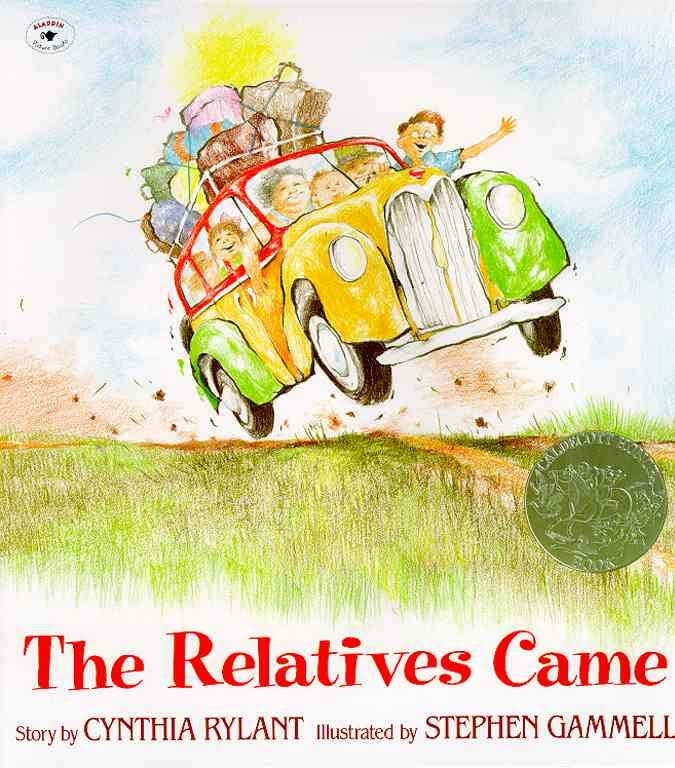 The Relatives Came by Cynthia Rylant This is a precious book about a family reunion. 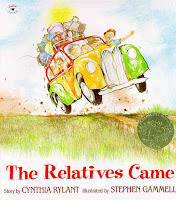 The Relatives Came would be a great text for introducing extended family members. I love this book! Rylant is one of my favorite authors. I don't know why but this book gives me chills by the end. Every. Single. Time. It's not a sappy, tear jerker book. In fact, it's quite humorous-- but it's also heartfelt. Bear's Busy Family A simple story of a bear family This book includes Grandparents, Mom, Dad, Uncle and Aunt, Brothers and Sisters, and cousins. The text is very simple. There is a darling bear family tree at the back of the book that you'll fall in love with. 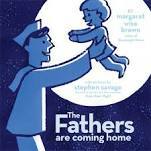 The Fathers are Coming Home --This book was written by Margaret Wise Brown (Goodnight Moon, Runaway Bunny) but wasn't published until recently. In this story, fathers return to their children... both a human father and many animal fathers. I was instantly attracted to this book. It is a very repetitive story, although the text isn't as repetitive as some children's books. This book is probably best for toddler/young preschool as there is not a great deal of "story" to it. The illustrations were recently done but seem old -fashioned and simple. My preschooler, Logan, likes to count the animals on each page. What's in Baby's Morning? By Judy Hindley This simple book chronicles a baby's day with lots of loving experiences with family members. I Love My Mommy Because...Cute board book detailing the things mommies do. Illustrations are based on animal mother/baby pairs. My Dog is as Smelly as Dirty Socks by Hanoch Piven. This one is so good, it deserves it's own post. We created family portraits after reading this book! What are your favorite books for exploring families? This post is part of a series on preschool themes. Looking for another preschool theme? Check out my Books by Theme page. I will definitely look into the YMCA here in North Texas and see if they do a used book sale. I agree about kids needing their own books. Since our two year old was a baby I have read to her every night, and have always treated the books as "hers" and almost as if they were toys to be played with. Something fun. Now she takes out books on her own (we have a small bookshelf for her in our living room as well as tons and tons of books in her nursery) and she'll sit and "read". I was happy to find a site (yours) focused on books. I've loved them since I was a little kid. On your point in your recent blog about what kids are reading (or in my case) what I'm reading her, as she just turned two... I recently bought some original "Winnie the Pooh" and "Frog and Toad" books. That said, her favorite right now is "Green Eggs and Ham". She brings it to me and shouts, "EGGS HAM". By coincidence the publisher just contacted me (talk about synchronicity) about doing a post and giveaway about the 50th anniversary edition of that book. And of course I'm happy to write about my daughter's current favorite book. Here's a post I did about some of her other favorite baby books. Hope you are having a great weekend. Thank you so much for linking to WMCIR! We loved All Kinds of Families. I am adding The Relatives Game to my Evernote list, it sounds lovely. I have to check out the reunion book - it looks terrific! So many books, so little time. We read, read, read and there are always more wonderful books for us to read! It's interesting how many "Margaret Wise Brown" books have recently been published. I love these books. oo what a great list of family books :-) Love that you bribed them with the library! We love All kinds of Families by Hoberman. The illustrations are gorgeous and very different. Ooh Jackie - I love this idea for a post so much that I might need to steal it from you. We are at the library ALL the time, and I always mean to write about some of the great books that we find, but never seem to get around to it. This is a great way to do it. Also - I like how you look for books that are all a certain theme. You are so smart.